With Arnold Vosloo (THE MUMMY; BLOOD DIAMOND) and Trond Espen Seim (VARG VEUM; THE THING) on set in Capetown. With Trond Espen Seim (VARG VEUM; THE THING) and Boris Kodjoe (SURROGATES; RESIDENT EVIL). With Marcin Dorocinski (PITBULL, JACK STRONG) on set in Capetown. With Boris Kodjoe (SURROGATES; RESIDENT EVIL) on set in Capetown. With Simon Boer, Adina Vetter & Julia Maria Koehler on the set of MEDCRIMES. With Leopold Altenburg, Mario Irrek, Simon Licht, Mark Zak, Ralph Willmann & Eisi Gulp on the set of THE TUNNEL. With Yoko on the set of YOKO. With John Malkovich (IN THE LINE OF FIRE) in Munich. Shooting with Veronica Ferres in Munich. With Tobias Moretti & Helmfried von Luettichau on the set of YOKO. With Michael Brandner & Lilly Reulein on the set of REUNITED. Received a Gold Hugo Award at the Chicago Film Festival. With Laura Harring (MULHOLLAND DRIVE) at the Best Buddies Event in Miami. With Willem Dafoe (PLATOON) on the set of BORN ON THE 4TH OF JULY. 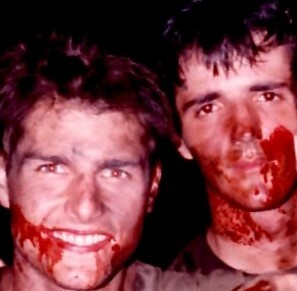 With Tom Cruise (MISSION IMPOSSIBLE) on the set of BORN ON THE 4TH OF JULY. With Chuck Norris (MISSING IN ACTION) on the set of DELTA FORCE 2. With Francesco Quinn (PLATOON) on the set of INDIO. With Billy Drago (THE UNTOUCHABLES) on the set of DELTA FORCE 2. With George Takei (STAR TREK) on the set of RETURN FROM THE RIVER KWAI. With Timothy Bottoms (ROLLERCOASTER) on the set of RETURN FROM THE RIVER KWAI. With Edward Fox (GANDHI, THE DAY OF THE JACKAL) on the set of RETURN FROM THE RIVER KWAI.